Just having a UG in technology would not suffice in today’s competitive job market. On the other hand, you need to log into one or two short-term courses after B.Tech. Therefore you need to know the list of short-term courses after B.Tech. And this article will guide you in that. Before going into the list of courses, why should you do small courses after graduation? Let us place the scenario. May be you are finding it difficult to get a job after your B.Tech course. Or maybe you have a great interest in one part of the technical or other aspects. 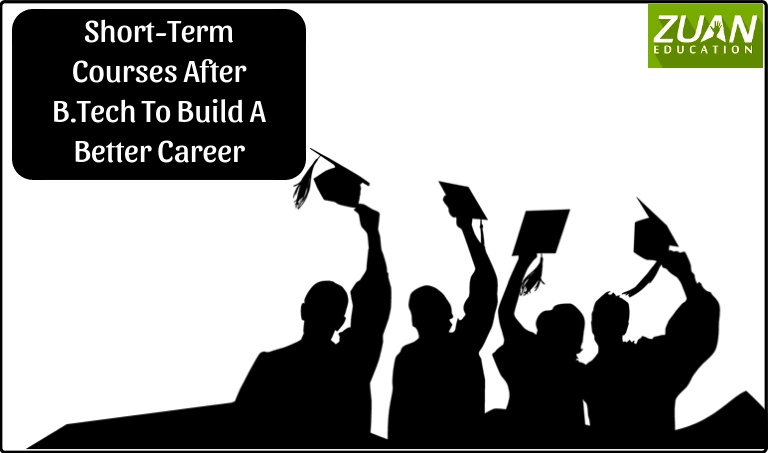 And want to hone your skills in that particular interest after your graduation degree. Or maybe one discipline of career fetches you more salary. And you want to master it. Moreover, your B.Tech course will not teach a specialization course in that field of your particular interest. In view of this scenario, you may be searching for institutions that offer such short term courses. And consequently the list of short-term courses after B.Tech graduation. Let us do a small research on those courses that will easily fetch you a job. You can do the following short-term courses after B.Tech before you go for higher studies. And of course to get a decent job too. Java is an object-oriented language that enables you to create real-world applications. Furthermore, any Java technology-based software works almost everywhere. Starting from the smallest devices to supercomputers. This is one among the important short-term courses after B.Tech. Learning Java course from a renowned IT institution will give you high opportunities to get a job easily. Furthermore, you will be the highest paid professional and enjoy the best of benefits and incentives. The fees for doing this course is not more than Rs. 5000-15000. You can complete this course in 3-6 months. Moreover, though you would have learned Java in college, you get more practical training in private IT institutions. Furthermore, after specializing in Java you will surely get various jobs. Such as Java Programmer, Java Web Developer, Java Webmaster etc. Significantly, the average salary for a Java Developer is Rs 4 lakhs per annum. Both of these are important short term courses after B.Tech. Doing this course leads you to make better decisions and strategic business moves. Moreover, Hadoop is a software framework for storing and processing Big Data. To gain more hands-on experience you can get Hadoop training from professional institutes. Consequently, you can implement the latest technologies in your organization, to meet the current and upcoming challenges of data management. Correspondingly, the fees for these courses is between Rs.15,000-40,000. Moreover, you can finish th course in 1 to 3 months. After doing this course you will get jobs like Hadoop developers, Chief data officer, Data analyst, Big Data Engineer, Data Architect etc. Like Hadoop, you can also get excellent training in Big Data from premier professional institutes in major cities. You will be paid 5 to 30 lakhs per annum in thes job roles. Hence they are one among the significant short-term courses after B.Tech. If you are a creative person equipped with the right skills you can land in a creative director/content development manager job. Web Designing is one among the prominent short-term courses after B.Tech. In web designing and web development you will learn the skill of producing and maintaining websites. Skills in web designing course are interface design, graphic design, web graphic design, user experience design, and SEO i.e. search engine optimization. The fees for this course starts from Rs. 14,000 on wards. The salary that you will draw after finishing this course is between Rs 3-9 lakhs per annum. Learning courses like SQL, C, C++, HTML5 from leading IT institutes will make you a real-time programmer. They are the key short term courses after B.Tech. The starting rate to do this course is Rs. 5000 and above. You learn lot of techniques like Datatypes and Operators, Arrays, HTML5 Semantic Tags etc. You can find yourself landing in a ot of careers like Software Developing and Web Developing. This is another vital area in the short-term courses after B.Tech. Software testing course in a private institution will teach you both manual and automation testing. The starting rate of the course fees is Rs.9000 on wards. This field can always be hailed as the most prominent among other short-term courses after B.Tech. Several premier institutions, especially in cities like Chennai offer specialized Digital Marketing courses. Digital channels and social media are becoming the most essential of all modern marketing tools. All the functions in business involve digital platforms. That is why you need to have the basic knowledge & techniques which are being used commonly in digital marketing. Digital marketing course is one among the most economical and beneficial skills you can acquire these days. Apart from the above mentioned courses you can do other course like, human resource, accounting and taxation etc. Short term courses are conducted in a time interval of less than one year. These courses help you to practice the theoretical knowledge that you gained in your college education. Moreover, this hands-on training is essential for success in your job. Furthermore, these short-term courses help you to develop new skills. And also add knowledge based on the requirements of your operating business. Equally important, these courses will improve your character. For example, they will give an ideal idea to deal with the real-time problems you will face in your job. Most important, these courses will make you interactive. Chiefly, you can learn to manage different people in different scenarios without any hesitation. Markedly, you will learn the art of decision-making also.